Chicago is a city of great neighborhoods, made distinctive by history, ethnic mix, and vibrant street life and culture. The Great Neighborhood Restaurant awards honor restaurants all over the Chicagoland area which contribute to their neighborhoods’ and the city’s character by offering outstanding food, an authentic experience of their ethnic culture, and/or a welcoming (or in some cases, belovedly cranky) atmosphere for guests. 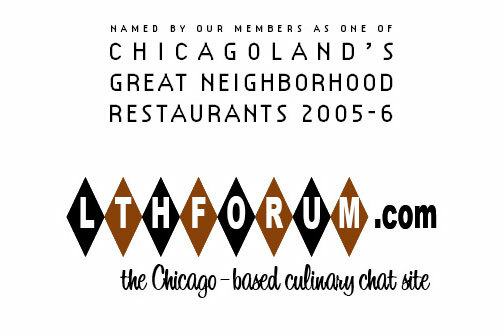 Restaurants are nominated by registered members of LTHForum.com, the Chicago-based culinary chat site, and ratified by the moderators of the board based on the degree of discussion and community-wide enthusiasm evidenced on the site. The first round was announced on June 15, 2005 and included the following 27 restaurants, which truly cover the gamut of great Chicago dining experiences—from a cutting-edge concept to a Capone-era flashback, from Chinese in Lisle to Mexican in Joliet, from comfy Italian-American to mind-expanding authentic Thai. Click on each restaurant’s name to read the nominating thread for more details. Barbara Ann’s-- South side BBQ joint serving excellent ribs and arguably the city’s best hot links. Chuck’s Southern Comforts Cafe-- South suburban Burbank’s best restaurant by a country mile, a Frontera alum dishing up high-class comfort food. Manny’s-- Cafeteria serving old school Jewish deli classics to a democratic crowd ranging from machers to meshugas. Moto-- “Scientific” food at the far end of the cutting edge, by a chef who entered our virtual neighborhood to debate his cuisine with us. White Palace Grill-- Roosevelt Avenue 24-hour hashslinging joint catering to a colorful mix of late night and early crowds. Ed's Potsticker House-- Northern and northeastern Chinese restaurant off the beaten path in Bridgeport. Fabulous Noodles-- Chinatown-quality authentic Chinese in a Lisle mini-mall. ”Little” Three Happiness-- Outstanding Chinatown hole-in-the-wall (from which LTHForum takes its name). Lao Sze Chuan (Chinatown location)-- Chinatown Mall restaurant serving seemingly endless menu of Western Chinese specialties. Moon Palace-- Upscale Chinatown restaurant serving Shanghainese food to those who know how to dig and beg for it. Cafeteria Marianao-- A little slice of Miami in a busy, ramshackle stand offering Cuban sandwiches and coffee. Klas-- Capone-era Mittel-European fantasy Czech restaurant in Cicero. Laschet’s Inn-- Authentic German food, beer and gemütlichkeit in the old German St. Ben’s neighborhood. Podhalanka-- A hearty Polish working-man’s spot, easily overlooked on fast-gentrifying Division Street. Al’s No. 1 Italian Beef (Taylor Street location)-- Taylor Street stand serving classic Chicago Italian beef and charcoal-grilled sausage. Freddy’s Pizza-- Cicero deli offering housemade Italian-American dinners, sausages, pizzas, gelato and breads. Riviera Foods-- West side Italian deli offering outstanding housemade sausages and sandwiches, including the “Will Special” (named for LTHForum member “Your Pal Will”). Sabatino’s-- Sinatra-era Italian-American fine dining restaurant serving Chicago classics like Chicken Vesuvio. Katsu-- On an obscure stretch of Peterson, pristinely fresh and beautifully prepared sushi, sashimi and cooked dishes. Amanecer Tapatio-- Could the best and most authentic Mexican restaurant in the Chicagoland area be this tiny, very friendly storefront in Joliet? Frontera Grill/Topolobampo-- Rick Bayless’ River North restaurants, which pioneered authentic, upscale Mexican food in America and helped bridge the gap between Chicago’s ethnic and expense-account food cultures. Taqueria la Oaxaqueña-- Pair of fine family Mexican restaurants on north Milwaukee and west Diversey, serving outstanding freshly-made versions of classics like chicken mole. City Noor-- Excellent Palestinian restaurant related to an adjacent meat market on the Kedzie middle eastern strip. Spoon-- Lincoln Square Thai restaurant famous for “secret menu” of brightly authentic Thai dishes. TAC Quick-- Chic Uptown Thai spot serving eye-opening authentic grilled meats and Thai curries. Tank Noodle (Pho Xe Tang)-- Bright and welcoming Argyle Street spot serving excellent versions of Vietnamese soups such as pho and entrees. The winners have been chosen. Threads for other nominations will be removed shortly, with any useful info merged into threads on other boards. For explanations of those places not chosen, please visit site talk. Thanks to Mike G, all the nominators and mods for making this happen. Thanks to everyone for participating. The results exceeded our expectations, though everyone has at least one place they cannot believe was not chosen, so I think there will be another nomination period one of these days. Stay tuned. My goal is to be able to say I have dined at every one of these places by the end of the year. It's important to have goals in life.